"BARBARISM IS THE NATURAL STATE OF MANKIND," THE BORDERER SAID, STILL STARING SOMBERLY AT THE CIMMERIAN. "CIVILIZATION IN UNNATURAL. IT IS A WHIM OF CIRCUMSTANCE. AND BARBARIANISM MUST ALWAYS ULTIMATELY TRIUMPH." Conan the Barbarian features the countries of the north: Asgard, Vanaheim, Hyperborea, and Conan's own homeland of Cimmeria. These rough lands stand in stark contrast to their more civilized neighbours in the south, and the folk of these countries possess a savage vitality that has long been lost elsewhere. These lands and people survived the great Cataclysm, yet barbarism is still the dominant way of life. Many people in the Hyborian kingdoms think these northern lands near mythical, but contained in these pages is a hoard of legend, lore, and facts for the gamemaster and players alike, to explore and adventure within these harsh and unforgiving kingdoms. 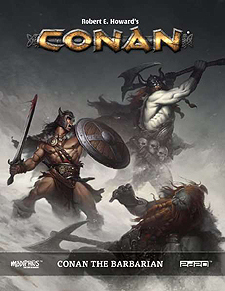 A gazetteer covering the region Conan came from, bleak lands shrouded in snow and ice, and wreathed in fog. Detailed guides to the walled fortress cities of Hyperborea, the unruly clans of Cimmeria, and the warring tribes of Nordheim, the AEsir and Vanir.